Are 877 Numbers Toll Free? Yes, Here's What You Need To Know. The fact is 877 toll free numbers work the exact same as the traditional 800 toll free numbers do. In the 1960s the first toll free numbers with the area code 800 were released. Once the availability of 800 numbers became low, the FCC decided to release new toll free numbers with the following area codes: 888, 877, 866, 855, 844 and 833. Here at UniTel Voice, we can help you find the perfect toll free number in any area code (including 877 numbers) in less than a minute. Just click the “Get a Toll Free Number” button below and start your search. Are 877 numbers toll free in the same way as traditional 800 numbers? 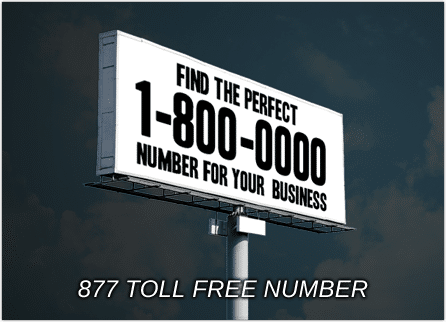 Yes, 877 numbers are toll free and work the same way as traditional 800 numbers do. The only difference is the prefix (or technically the toll free area code). How can I get an 877 number for my business? UniTel Voice has many 877 numbers available that you can sign up for with instant activation – no setup fees and no long-term contracts. You can use your toll free number on one of our affordable toll free service plans or port it to another provider of your choice. Why is it hard to find a good vanity 877 number? The supply is low. Because 877 numbers were first released many years ago, a lot of them have been snapped up by other companies. You can use our search tool to look up available 877 numbers but if you cannot find the vanity number you want, you can always try another toll free number prefix such as 800, 888, 866, 855, 844 or 833. You’ll find the greatest number of options with 855, 844 and 833 numbers because those are the most recently released toll free numbers.